High School Class of 2020 Seniors for our MOD SQUAD '20 Model Team!!! Love our style? Want to add an incredible model experience to your senior year? Want to be photographed by one of the most sought after Senior Photographers in our area? 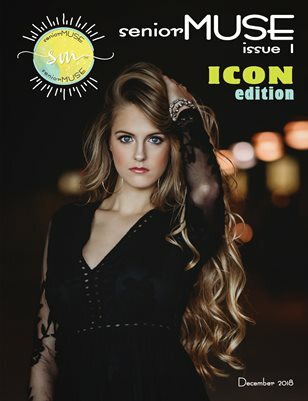 We received the awesome Top 100 Award from Senior Style Guide for the second year in a row and also the Icon Award (top 25) plus Senior Year Magazine’s Top 200 Worldwide, Best of 2018 Award by Inspiring Teens, and were published in five magazine in the last year. We LOVE what we are blessed to do! If you answered yes, we are looking for outgoing high school Seniors that are fun, energetic, dependable, outgoing, natural born leaders, who love sharing their images on Social Media, and want to be the face of our studio. Do you have to have model experience? No, we've got you covered! Are you looking for a certain type? Yes, every type!!! Everyone is welcome to apply. I believe everyone is beautiful. Really, I do. We are made in the image of God, right? You are beautiful! I look for it and I capture it. Does it cost anything to be part of Mod Squad ‘20? There is not an additional fee. We want to be your senior photographer. So, we must be your exclusive Senior Photographer (other than your school photos of course). Every Senior that we photograph pays a $200 Session Fee and has a minimum order requirement of $750. To give you a general idea about pricing, the majority of our clients invest $2,000 or more. Our Print Collections begin at $750, our Digital Collections begin at $1500, and our combination Print and Digital Collections (Most Popular) begin at $1995. →As a Senior Client: you will have your very own Senior VIP Session custom created just for you. We offer a Senior Experience like no one else in our area. →→As a Mod Squad ‘20 Model: You receive everything a Senior Client receives PLUS a fun Model Experience with 2 guaranteed exclusive sessions for our Team, and opportunity to participate in a Destination Session, all of the fun and friendships that Mod Squad Models Experience, and to be the face of our Studio. What’s the Catch? No Catch. If chosen, you will book your senior session with us, prepay your minimum order requirement ($750 that will fully be credited toward your senior order), and let the fun begin. Why do we require the minimum order requirement be prepaid before Mod Squad ‘20 begins? We had to learn this one the hard way. In five years of having Mod Squad, we had 2 models be a part of every Mod Squad session, they enjoyed all of the fun but didn’t follow through with placing their Senior Order. The good thing? When you do have your Senior Session, you already have a $750 credit. Any More Questions: Feel free to email me (kristi@kikiscornerphotography.com or call 432-756-2221) Or better yet, make an appointment to come to our Studio and meet me in person. We are so excited about all of the plans we have for this year!!! INTERESTED? Complete the application below! ****Go to YOUR Instagram account and REPOST one of our Instagram Pictures. Then, tag @kikiscornerphotography and at least 5 of your Class of 2020 friends to let them know we are accepting applications. ***Do NOT skip this step! We always check. If this step is not completed, your application will not be accepted. If you were a # (hashtag) what would your ONE word hastag be?